It is very evident that we have the fastest period ever in Skype growth, after many months of stagnation, almost 300 days! (See also my post of December 26, Stuck @ 30 million). Thereafter we reached slowly the 31 million people online half January! In some weeks we went from 31 million concurrent people online to (yesterday Monday April 10, 2012) 40 million concurrent users online. Very interesting to note also that the 40 million milestone was reached on a day that was a Holiday in quite some countries. As my blog reader Raffaele D'Abrusco correctly noticed, usually there is a drop of concurrent users online when big countries have a Holiday! Well, to be honest, we had also some "record" days on a Sunday the last weeks, same reasoning … quite unusual if we compare with the past history! 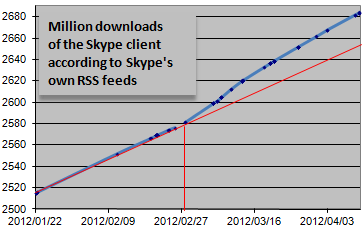 And indeed, when we look at the download curve of Skype clients, we see clearly a bent in the download speed from the end of February on, exactly at the moment of the Skype for Windows Phone app release, see graph below! When will this stop? At the "Summer recession"? Hi Jean, thank you very much. very interesting download number. But would most of the nearly 100mn downloads(2680mn-2580mn) come from windows phone? I doubt it actually. Do you have skype mVOIP related numbers, such as download, calling minutes, DAU on skype mobile? Thanks for your comment. No, of course I do NOT think that all the new downloads come from the Windows app, but part of the acceleration id downloads yes. But it is a guess, because I do not have any more details. My information comes from the Skype RSS feed, and this doesn’t provide more information. Skype almost not provide information the last years: people online, and downloads, and sometimes minutes called. Bannerizer makes it easy for you to promote ClickBank products by banners, simply visit Bannerizer, and get the banner codes for your chosen ClickBank products or use the Universal ClickBank Banner Rotator Tool to promote all of the available ClickBank products.